From last week’s post we found that an organization may have the happiest of staff and still not bring in the numbers. Clearly, there’s more to achieving a right balance than just healthy work relationships. There are several elements that make organizations successful. The ability of an organization to leverage on its strengths and the efficiency in the use of its talent, systems and unique strategies has the ability to set it apart. Google’s impeccable policies towards ensuring an enabling and balanced environment for work is an outstanding example. Likewise, NetApp for the 12th year has continued to feature on the ‘great place to work‘ list while consistently improving its bottom line. 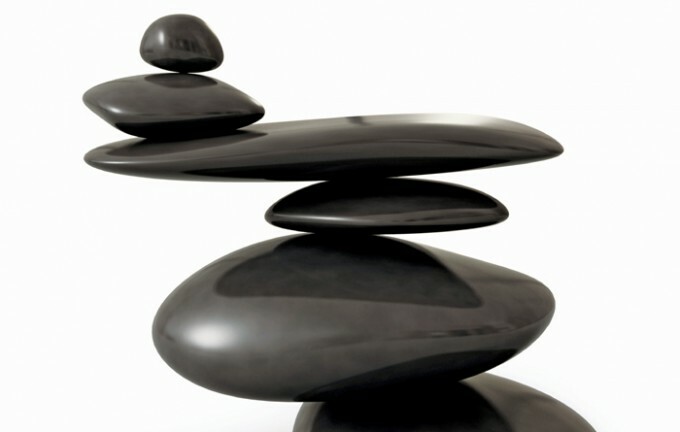 Balanced organizations share a common theme. In this post, I have put together some useful tips on how Q2 – Q4 organizations can transition into Q1 organizations. A Clear and Focused Mission targeted at achieving ‘specific’ and ‘measurable‘ goals . Employee Buy-in: A sense of shared responsibility. Employees’ understanding of roles and how it fits into the overall corporate objective. An environment that encourages mutual respect: Zero tolerance for morale damaging behaviour, bullying or intimidation. A culture that supports fairness: Credible processes and meritocracy. A system that rewards outstanding performance, individual-based as well as team-based. Investment in employees’ personal and professional development. Priority placed on the health and safety of employees: Having adequate systems in place to cater to employee health including stress management. Promoting an environment that encourages innovation. Accountability: Performance review sessions/meetings which provide an avenue for team bonding, target setting, brainstorming, feedback and recognition. Predominantly objective rather than subjective performance measures. Lean model of operation: weeding out waste and inefficiencies in the system. Q1 organizations drive performance and do not hesitate to stretch employees’ capabilities. ‘Going over and beyond’ is often the mantra. Job design/re-design with sufficient attention placed on valuable and challenging work. People naturally flourish in their areas of strength. Employee engagement is often higher when tasks are valued by the staff -a feature that often accompanies work which challenges employees’ mental development. In essence, get employees interested, get them to enjoy what they do and you have a winner on your hands! Open and honest communication: Reducing the power distance by encouraging a free flow of information. Employees, especially subordinates/associates, must feel free to air their thoughts,share ideas and suggest solutions. Management’s unrelenting commitment to the business, its superordinate goals as well as the value it places on employee contribution, employee welfare and advancement is vital. Promoting work-life balance: The idea isn’t to break the bank in order to attain a similar level of commitment like the Googlers. Employing ‘Human Analytics’ is useful for generating data to determine such things as what matters most to employees and which policies would be most appreciated. The key is to attain a fit to context. Hence, there is the need to understand your business, know your people and in so doing, design systems, processes and the organization’s structure to support a healthy work environment and at the same time, optimizing value. I wonder, is it possible to have a pleasant work environment and at the same time, achieve/surpass corporate goals? Or are they mutually exclusive? 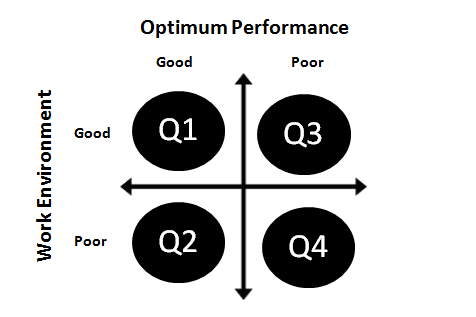 My musings have led me to do some research, and consequently, I have been able to categorize organizations into 4 main types using a performance and work environment matrix. First, there are the organizations which have managed to master finding the right balance between optimum performance and a “trust work environment” (Q1). Then there are the Q2 organizations, where work relationships do not necessarily matter as much as the achievement of corporate goals (i.e. where relationships are deemed inconsequential, and are sacrificed for the attainment of corporate goals). We also have Q3 organizations that pursue good work relationships/friendships at the expense of performance. Lastly, the Q4 organizations are those failing on both counts that is, performance as well as the ability to build and sustain good work relationships (this might be an extreme case of course). 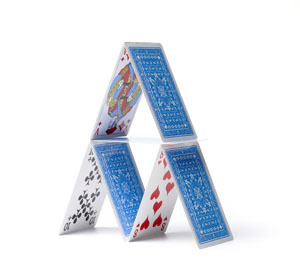 What I find is that most companies exist within Q2 – Q4, with only a fraction striking that perfect balance. In researching Fortune 100’s great places to work and combining same with the Fortune 100 companies, I observed a common theme in some of the practices employed by these Q1 organizations. I have put together some of these practices that serve to foster a healthy balance. These practices (which shall be discussed in the next post) are premised on the fact that a sense of shared responsibility, mutual respect and a trust environment foster engagement, which ultimately result in high performance. While Q1 might be challenging to achieve, it is by no means impossible.